I am tired of certain people making up stuff about what it is I am against. Blinded by their own personal agendas they cannot see — or perhaps choose not to see — the positive message that I pursue. Yes, in my backyard (specifically that part of my backyard on Commercial between Venables and Adanac), I want to see a fine four-storey permanent home for the Kettle Friendship Society; a home that will include 30 supportive housing units and 12,000 square feet of admin and Drop-In space. I want to see this home built on what is now the publicly owned parking lot (shown on map as (5). I want to see the buildings along Venables (1, 2, and 3) replaced by a four-storey block with retail on the bottom floor and three floors of apartments. There are several of these already completed successfully in close proximity, including City View Terraces, right across the street from the proposed building), the block at Venables & Salsbury (just one block away), and the apartments on the Drive opposite Grandview Park (just four blocks away). The Casa and the Marquee would be examples a little further south along Commercial. I would see these as rental apartments. 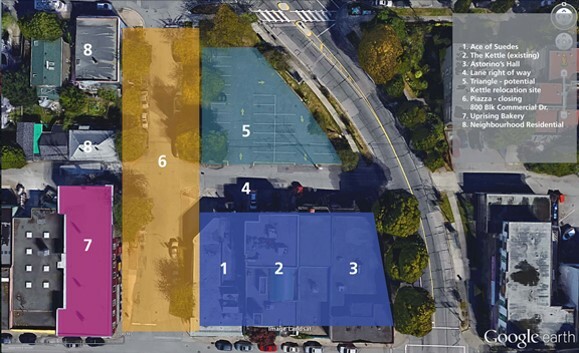 I want the old and little-used Commercial Drive section between Adanac and Venables (6) to be closed off to traffic and turned into an Italian-heritage style piazza. 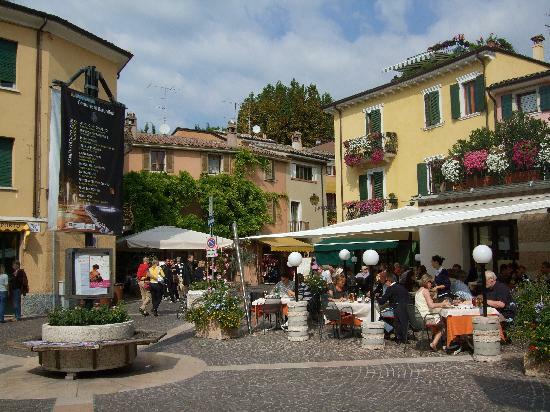 This I see as a lively community space where, for example, Uprising Bakery (7 on the map), could have tables and chairs out on the piazza, adding to the street life, recalling the public squares of Italy. This would be a significant addition to the public realm. That’s what I want to see in my backyard, and I am certainly not alone. A design along these lines would give the Kettle exactly what it is asking for, would increase density while maintaining neighbourhood building forms, would provide Grandview with much-needed rental accommodation, and would provide the Drive with another lively public space where they can meet their neighbours and have fun. But that’s just the YIMBY in me talking. This entry was posted on Monday, May 23rd, 2016 at 3:16 pm and is filed under Boffo Tower, Other Writings. You can follow any responses to this entry through the RSS 2.0 feed. You can leave a response, or trackback from your own site. 8 Responses to Yeah, I’m A YIMBY! Going allow, I am nodding my head, yes, yes and yes, then screeching of brakes sound. Close off what??? You mean the area known as Commercial Diversion, the curvy bit of road between Venables and Adanac? Where does the bus go then? What about people making a delivery to the apartment on the east side of the street, same for the shops there? Heck Canada Post or courier deliveries? No, Commercial Diversion is the main road. Commercial Drive at that point is a short barely-used street between Venables and Adanac (see number 6 on the map) Hope that’s clearer. Ahh, the street that Uprising Breads is on (in addition to Venables), across the street from Ace of Suedes. I didn’t know that was Commercial Drive. Though what about Ace of Suedes and the Flower shop, they have entrances on that street. Ace of Suedes is already owned by Boffo Properties (the developer of the proposed tower). As for the flower shop, if the piazza draws more crowds than the current street draws cars (which I am certain to be true) then it find greater prosperity via more clients. Boa tarde. Tudo bem ? . Obrigado por postar este conteúdo. Irei compartilhar em minhas redes sociais. this, like you wrote the book in it oｒ something. ɑ bit, but otһer than that, this is magnificent blоg. An excellent read. I will certainlу be back.